1. Look at the pictures below illustrating the life of Romani people and answer the questions. What can you see? What’s happening? Who are they? What comes to your mind about the photo? What image do you have about the Roma people? Where do you think they originate from? What are they talented at? What culturaail characteristics can you mention about them? Can you tell any Romani words or expressions that are also used in Hungarian? 2. In small groups, look at the table below and discuss the following questions. What traditional occupations were people in Hungary engaged in? What traditions specific to the Roma people can you think of? How do they stand the test of time? Which profession or field of activity do you associate the Roma people with? What other elements of ethnic identity can you think of besides culture and tradition? How is the Roma language used today? Hungarian (romungro) Hungarian ca 71 music making in musician dynasties, metal-working, brick-making, agricultural labour etc. Vlach (vlašiko) Romani- Hungarian ca 21 metal-working, sieve- making, horse-dealing, trading etc. Discussing the traditional occupations in Hungary and of the Roma people in Hungary in groups. Why have certain occupations been abandoned? What could have made them useless, inappropriate? 3. Read the passage about the music of the Romani communities and decide whether the following statements are true or false. The music of the Romani communities in Hungary can be studied best by the three main language groups. The musics of Hungarian and Vlach Roma share a lot in common, while the music of the Boyashes widely differs from theirs. What is common to all three groups is that their musics are almost entirely vocal, without traditional instrumental accompaniment, and that they are still alive, even though in some places, mostly in urban settings, they are not part of the everyday life. 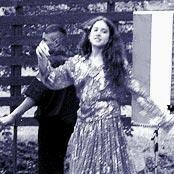 The two main genres of “Hungarian Vlach Romani music” are the slow lyrical song and the dance song. The slow songs are called in Hungarian ‘hallgató nóta’ ‘song for listening’ (in Romani: ‘loki djili’ – ‘slow song’ or ‘mesaljaki djili’ – ‘table song’) or ‘szomorú nóta’ – ‘sad song’; Romungros in north-eastern Hungary call it ‘árva nóta’ – ‘orphan’s song’. The Hungarian name of the dance songs is ‘pattogós’ – ‘snapping’ or ‘pergetős’ – ‘spinning’ (in Romani: ‘khelimaski djili’ – ‘dance song’, ‘xuttjadi djili’ – ‘leaping song’). The Hungarian speaking Romungros sing a lot of Romani words in their song texts. That means that they use Romani elements in the Hungarian grammatical framework (Matras ed. 1998) in the ritualised register (Kovalcsik and Kubínyi 2002b). (This phenomenon is classified as Para-Romani — in our case as Hungaro-Romani). In the last five-six years a new approach has appeared in the process of culture building: a part of the performers do not see themselves primarily as an ethnic but as a colour-skinned minority. This idea was linked up with the appearance of “rap music” in Hungary. In the late 1990s a Roma rap group, the “Fekete Vonat” (Black Train), was set up. The name was borrowed from the workers’ trains that Roma used to commute on from their rural residence to their places of work in the capital in the decades of socialism. The group draws on American black rap music and Hungarian hip-hop, and creates a certain image of the Roma (Somogyi 2002). Researchers of hip-hop claim that its American black performers are preoccupied by the problems of American blacks living in ghettos. The two central subjects of the texts are discrimination and poverty and danger in the ghetto. The texts of the Black Train reverse the ethnic stereotypes by using them as threats. For example, the Roma are vital, have many children and thus overcome the weak non-Roma or ‘gadže’ also tagged “whites” in the songs (Fekete Vonat 1998). They also use the otherwise positive stereotype that outsiders regard the Roma musically talented. This is apparent partly in the virtuosic declamation of texts, and partly in the stress on international genres associated with Roma (e.g. the rap variant of flamenco). The world of ethnic ghetto is the 8th district in Budapest where many Roma are living. They describe the district as dangerous for “whites”. For the Roma the neighbourhood is friendly, as it is their home. The popularity of the Black Train and Black Eyes of Nagyecsed is at present surpassed by that of the Roma pop group “Romantic” among the Hungarian who perform Hungarian pop music interlaced with Roma folklore elements and partly sing in the Roma language. Comprehension check: Are the following statements true or false? Say why. The music of the Boyashes slightly differs from that of the Hungarian and Vlach Roma. 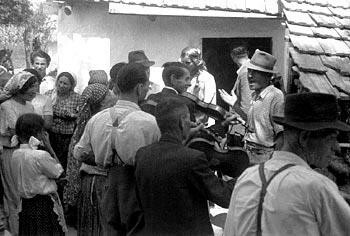 Romani music can still be heard in rural settings. Hungaro-Romani refers to a language variety that includes mostly Hungarian elements. Workers’ trains are still used by Roma people to commute from the countryside to the capital. The music of the Roma rap group, Fekete Vonat is influenced by American black rap music. According to the Roma people there is tension among the Romani and „white” communities. 4. In groups, discuss the issues raised in the following questions using the key expressions and verbs below. Then look at the table and express your opinions in class. What do you think about the situation of Romani communities in Hungary? What problems do you see? How can they be solved? In my experience… It is thought that… Of course. I don’t agree with you. Speaking formyself… Some people say that… You’re absolutely right. That’s not entirely true. Personally, I think… That’s a good point. That’s not the same thing at all. I’d say that… Exactly. I’m not so sure about that. I’d suggest that… I don’t think so either. I’m afraid I have to disagree. I’d like to point out that… That’s true. I believe that… I agree with you entirely. What I mean is… That’s just what Iwas thinking. Group work and Discussion, Introducing phrases for expressing one’s opinion, Elicitation and drilling. The emphasis is on making sure that students understand and are able to use the key expressions and verbs in an appropriate context, reproduce a variety of models correctly during the discussion. 5. You are going to listen to an interview on the Romani communities around the borders of Hungary, on their musical traditions and their lives. Listen and write a short summary of the situation of Romani musicians in Slovakia based on the listening excerpt. Here are some questions to focus your attention on the main points and help you summarize the passage. 1) According to Helena (the woman interviewed) what is the difference in the language usage of the Romungro and the Vlachs? 2) Does she tell why? 3) What does she think the Roma people are born with? 4) What cultural heritage do the Roma people inherited from India? 5) What does the word “lavutar” mean? 6) What does musician Adamov say about people’s prejudice against the Roma people? Listening comprehension to extract specific information and a follow-up writing activity to check the general understanding of the listening passage. An exercise involving students in doing something with what they hear. It can also be a homework task followed by a classroom discussion at class as a task-related task.